In our company, we have virtually signed a memorandum of understanding the market trends, client's requirements, & latest developments related to the manufacturing of flexible conveyor system. Consequently, we consider various needs, demands and deployment scenarios, in addition to evaluating the applicability and performance potential of new techniques / technology to elevate the quality standards of our conveyors. This material handling equipment includes a conveyor beam made of stainless steel or aluminum; and the plastic multi-flexing chains are guided by low friction slide rails. 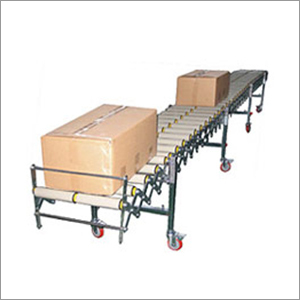 The products which require traverse, are placed directly on the conveyors, carriers, or pallets. The innovative flexible conveyor system can work round the clock, without any stoppage due to obstacles, and hence ensuring continuous production. These versatile machines are applicable in multiple environments such as case packing, food packing, pharmaceutical, and even in retail stores. Technical parameters: Conveyor speed, width, maximum / minimum height etc.